What makes Jersey Jim the best kids magician? Simple: entertainment value. Jersey Jim is an accomplished magician, but the secret to his success, and the reason schools and families keep having Jim back year after year and the reason kids tell their parents they want Jersey Jim to come back over and over is because he is also a great entertainer! “I’ve never seen kids laugh so hard with their full hearts!” one preschool owner said. Many adults are shocked by how Jersey Jim can keep young children entertained and fully engaged for hours. “The kids don’t want Jim to stop!” How does Jersey Jim do it? How does he keep children entertained non stop for hours on end? It’s simple: he keeps the children involved in his magic shows. That’s the magic word: involved. Kids just don’t want to just sit there and watch magic, Jim says. Children want to be involved. So, the same way that Jerry Seinfeld plans his stand up shows so that every 5 to 7 seconds he’s getting a laugh, Jersey Jim likewise plans his routines so that every 5 or 7 seconds his audience of children are involved. Jim does this by using some simple but extremely effective techniques. One is called “Look Don’t See,” where the children see something but Jim doesn’t. Another way is the magic doesn’t work until the children say the magic word, another example is Jim will simple call something the wrong color and the children have to correct him. “As simple as that sounds, the kids love it,” Jim contents. Another bit Jim does is an example of “look don’t see:” Jersey Jim sometimes wears a wizard hat and every time he takes off the hat to take a bow, the kids see that he’s wearing a toilet plunger on his head. ” “They’re pointing and laughing and I’m telling them to stop laughing at me because I’m a serious magician,” Jersey Jim explains. And, by the way, while Jim is employing that gag, he is cutting and restoring a rope three times, which is very powerful sleight of hand, but he’s making it all about the kids having a great time. That is what is why so many people call Jersey Jim the best kids magician they have ever seen. Every one of Jim’s magic tricks is part of a full routine–like a game–that the children are involved with. And, unlike most other magicians, Jersey Jim creates his own original magic routines that you will see from no other magician. 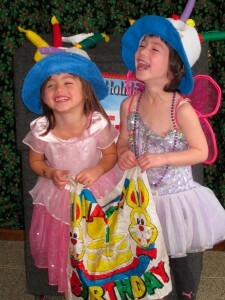 But the kids aren’t the only ones laughing and have a great time at Jersey Jim’s children magic shows. The adults are laughing and entertained just as much as the kids. The parents and adults love seeing the children having fun and being in these adorable situations, but Jim also includes lots of humor for the adults that go right over the children’s heads but leave the adults laughing their butts off. You see that in testimonial after testimonial where adults say we had as much fun as the kids did. So, it turns out, Jersey Jim isn’t just the Best Kids Magician they’ve seen, he is also the most entertaining magician period. This entry was posted in Birthday Magician, Magic Shows for Children and tagged best birthday magician, Best Childrens Magician, Best Kids Magician, birthday magic show, children's magic show on November 8, 2016 by Jim. 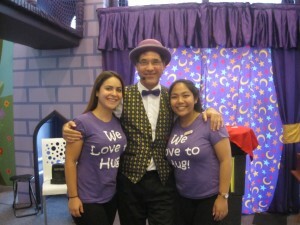 This past Sunday, Giggles n Hugs (www.gigglesnhugs.com/) southern California’s premiere children’s and family restaurant and play area, hired Jersey Jim to perform for one of their exclusive private parties, celebrating a birthday party for a lucky little girl named Sophie. The entire venue was devoted just to Sophie’s party and for such an important event, there was just one children’s magician Giggles n Hugs asked for: Jersey Jim Comedy Magician. For years, Jersey Jim performed at all three of the Giggles n Hugs locations as their resident magician. “It was certainly a nice homecoming to return to Giggles n Hugs and see all the friendly staff and managers again,” Jim said. And, of course, Jersey Jim was a big hit with the children and families. 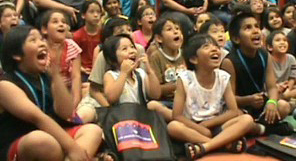 Many parents said they had never seen children laugh so hard before. One mother told Jim that he had a gift for entertaining not just the children but the adults as well. “I was laughing as hard as the kids!” she said. Jersey Jim does have a winning way with children; he is the most entertaining children’s magician you will ever see. That is what makes Jersey Jim the most popular children’s magicians in California and why parents have Jim back time after time doing his special brand of magic for their children’s birthday parties. But Jersey Jim also takes great pride in the fact that he entertains the adults as well as the children. There is non-stop humor for the grown ups as well as the kids. Everyone has a great time at the jersey Jim’s magic shows. This entry was posted in Magic Shows for Children, What's Up Jersey Jim? and tagged best birthday magician, birthday magic show, children's magic show on September 27, 2016 by Jim.